Within close proximity to the Ancient Minoan Palace of Knossos and the town of Heraklion, Agapi Beach is the ideal all-inclusive family resort. 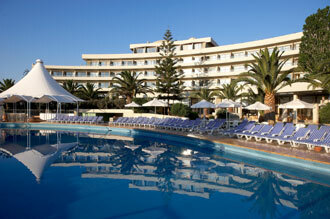 Its prime location allows guest to relax on the beautiful beach or explore the wonders of the Minoan civilization. With three pools, a long sandy beach and endless gardens, the resort is the perfect place for long holidays. All 320 guestrooms are furnished in a contemporary style with light summer colours. Guestrooms and bungalows are located in the main building, the award winning annex or throughout the gardens and will match your expectations for a true summer vacation place. All guestrooms offer amenities to make your stay more comfortable and memorable, while Suites and Exclusive Bungalows host exclusive features. Showcasing a celebrated cuisine from the Greek and Cretan traditions, along with many international dishes, guests can enjoy the dining experience they want at the Main Restaurant, the Beach Front Taverna Akrogiali or at the Gourmet Italian Restaurant. Our vibrant lounge decorated with paintings and fine art and lobby bar are also focal points of the evening activity before or after dinner. Enjoy our all inclusive package and feel at ease that everything is taken care of before you arrive. Every day there are many activities and sports for parents and children. For memorable holidays stay with us and enjoy a host of facilities including: private sandy beach, three (3) swimming pools, tennis courts, water sports, water gymnastics table tennis, beach volley, atelier studio courses, Greek cooking lessons, garden tours, animation shows, folkore dance shows and many more.